Milwaukee is really a beautiful city. I suppose if you live anywhere long enough you become sloppy and sentimental about the place. But Milwaukee has a river that runs right through the middle of downtown. At night in the summertime, if you ride up and down the river in a run-about or even a kayak, the lights from the businesses and on the bridges dance on the water. It gives the city a rather magical perspective. 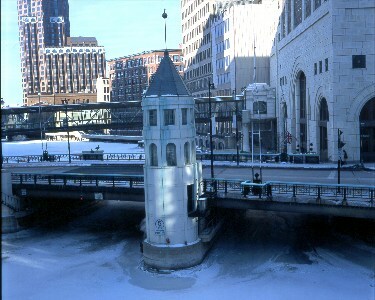 This is the bridge that crosses the Milwaukee River at Wisconsin Avenue. The photo was taken from the covered pedestrian walkway that also crosses the river between the Bank One building and the Grand Avenue Mall.